It was the last Making Common Ground workshop on Friday. We welcomed 6 new members to the group and 6 from previous sessions, so this was our biggest set of stitchers so far. This week’s conversations were just as interesting and far-reaching. We spoke about stitch as having been a long used method of quiet subversion or expressing a voice for otherwise disenfranchised groups. 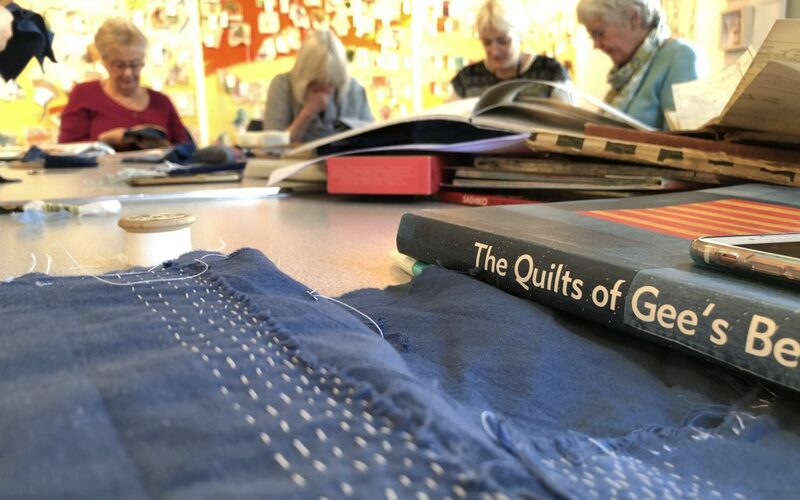 Examples shared by the group included the quilters of Gees Bend whose utilitarian patchwork developed into an expressive art form for cotton plantation slaves in the USA; beautifully embroidered Suffragette banners and the Craftivist Collective using cross-stitch as their tool for ‘gentle activism’. Our stitching of maps has allowed us to contemplate the significance of place and what it might mean to be displaced. It has also shown the value of coming together to share ideas and stories. I am sad that this was the last workshop but there were all kinds of suggestions as to how this project could evolve in future. When the session came to a close I was astounded at how far our stitched maps had taken us from Winchester. This week our most exotic new additions to our collective map were from the Solomon Islands and Papua New Guinea. We also had contributions that explored journeys through life and significant relationships as well as ideas of being lost. The embroidered maps created during these three Friday mornings have simple stitches but are laden with meaning. Thank you to everyone who came, stitched, shared their ideas and their stories. It has been a pleasure to meet you all. The outcomes of these workshops will be on show on the 25th Nov in the City Space alongside the ‘in conversation’ event 3-5pm. This event is free but places are limited. To book call 01962 873610.